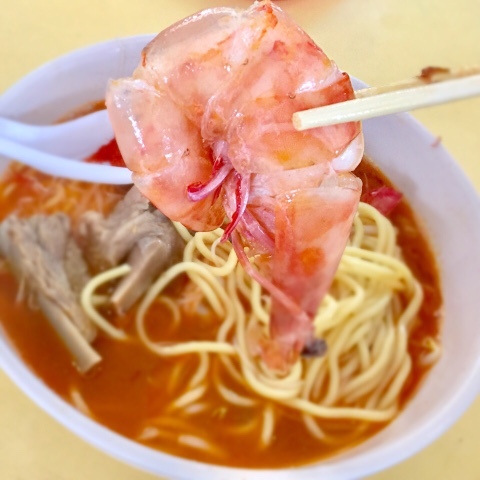 Albert Street Prawn Noodles at Old Airport Road Hawker Centre - Thumbs up! The most important factor in determining the deliciousness of any prawn noodle is the broth and I am sure most of you would agree. Nothing beats slurping mouthfuls of hot prawn broth. Albert Street Prawn Noodles broth is deliciously different from the usual big prawn noodles broth. 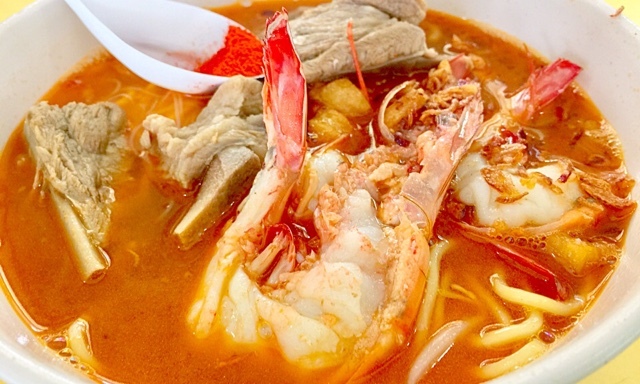 The usual big shots like Noo Cheng at Adam Hawker, Beach Road Prawn Noodle and Whitley Road Prawn Noodle at Old Airport Hawker C, boost of broth rich in prawn and bone flavours. Albert Street Prawn Noodles, other than being equally rich in prawn and bone flavours, it has another distinct fragrance which I could not make out initially - generous portions of deep fried pork lard were swimming in the broth. The taste made it a notch slightly higher than the big shots. At 11am on a Saturday late morning, there wasn't a queue at Albert Street. 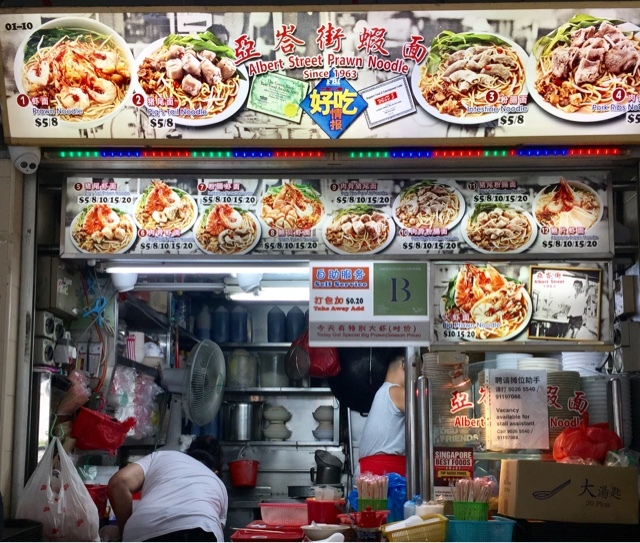 A short queue was already forming at Whitley Road Prawn Noodles just a few stalls away. It was extremely good news to me since I wanted to try Albert Street today as I came across a blogpost that Albert Street is a must try. I have always been patronising Whitley Road whenever I want to eat prawn noodles at Old Airport Road HC. Apart from the delicious broth mentioned, the firm prawn flesh and tender pork also scored big ticks. When you look at the big piece of pork in the picture, you probably thought that it would taste dry and hard. Surprisingly, it was very soft and tender. This was a huge tick for me as I usually order meat along with the prawns. Mr C was very sure that he would order Albert Street instead of the usual Whitley Road in future because in his words, "The soup is NICER." When I asked him what was NICER, he said, "Don't know, tastier." Albert Street Prawn Noodles is definitely worth your try if you are deciding which stall to order from. I would give full marks for service because it offers free refills of soup. As for me, I am still torn between Albert and Whitley. Both are nice! 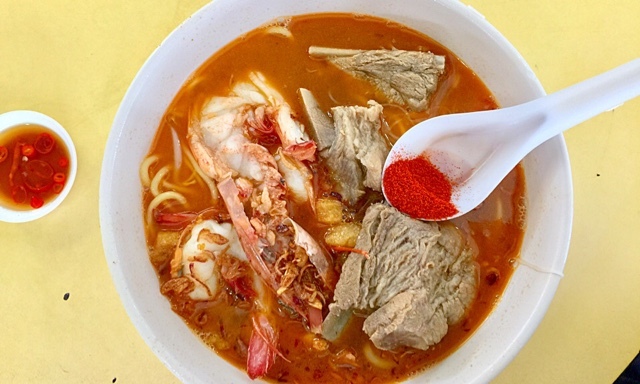 My personal favourite is still Beach Road Prawn Mee Eating House as I can also eat Wu Xiang. How about you? Leave your comments to share with me your views or any other good recommendations for Da Xia Mian. *I went on another day and tried Albert again. Whitley is better.